Last week, a sixth-century iron sword was found in an ancient burial mound in Fukuoka, Japan. What’s especially interesting about this sword is the 19 kanji characters engraved on it showing the date January 6th, 570 based on the Genka calendar. Researchers are excited because the sword is the oldest item indicating Japan’s use of a calendar in ancient times. And it’s also the first concrete evidence that the Chronicles of Japan, an eighth-century history of Japan, may have been correct in describing how the calendar spread across that country. 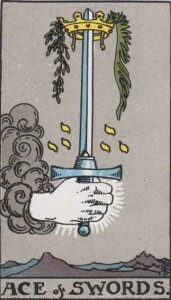 As a Tarot reader, I was especially drawn to this story because it featured a sword, one of the traditional suits of the Tarot. The Ace of Swords often represents focus, clarity of mind, and the seed of new ways of thinking. I think it’s wonderfully appropriate for a sword to be evidence of a new way of thinking for the ancient Japanese. The introduction of a calendar must have really shifted perspective. And I can’t help but notice that not only were there 19 characters on the sword, the date 1/6/570 adds up to 19, the number of the Sun. It looks like this ‘epoch making item’ is shining some new light on the history of Japan. You are currently reading Japanese Sword Shines Light on History at The Tarot Room.